In the age of YouTube, people have grown an addiction to making videos for everything under the sun. There are countless DIY videos, web shows, and vlogs (video logs), just to name a few. Even music videos have multiplied, having two, sometimes three different videos for one song. Sounds like just a waste of internet space, doesn’t it? In reality, it’s a pretty brilliant method of promotion. Lyric videos are a hot trend right now, with bands often using them as a teaser before their full-fledged video release for new singles. The opening shot of the video. But what is a lyric video? It’s exactly what it sounds like! 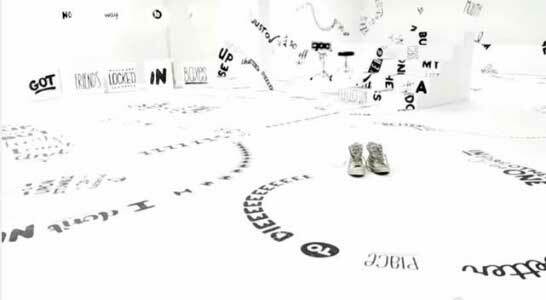 An entire video that’s just the lyrics to the song, usually done in a cool typographical way. A great example is fun.’s “One Foot” lyric video. It’s simple, and yet, despite the fact that it’s mainly words, it manages to capture the viewer’s attention for the duration of the song. You’re taken on a journey, of sorts. It starts out with a pair of chucks sitting on some white stairs until a pair of feet (wearing Bill Cosby Sweater-esque socks) puts them on. From there is where things get fast paced. Your eye never has the chance to stay anywhere for very long, however, you have just enough time to linger so you don’t feel overwhelmed. Lyrics written on the chucks. 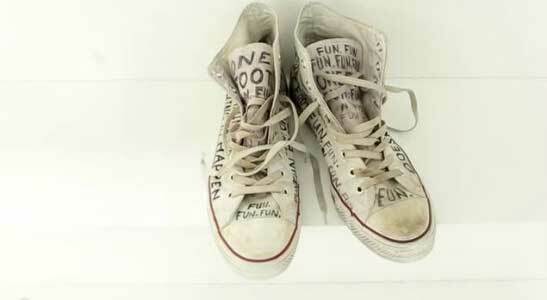 Chucks are the star of this video, and rightly so, as they even have some of the lyrics written on them. After the release of the video in 2012, the band held a contest for one lucky person to win the chucks used! Chucks resting in the middle of all the lyrics. Click on the links below to buy pairs of chucks to write lyrics on.